To evaluate the possible hemodynamic changes following strabismus surgery via optical coherence tomography angiography. Thirty-two eyes of 16 patients who underwent strabismus surgery in one eye were included in the study. Fellow eyes were used as a control group. The vessel densities of the superficial and deep capillary plexus and superficial and deep foveal avascular zones were measured preoperatively and 3 months postoperatively. The mean superficial and deep foveal avascular zones measurements were 0.84 ± 0.09 and 0.76 ± 1.13 mm2, respectively. The mean vessel density of the superficial capillary plexus was 1.23 ± 0.12 and 11.13 ± 1.04 mm2 preoperatively in the 1- and 3-mm zones, respectively, whereas the mean vessel density of the deep capillary plexus was 1.13 ± 0.16 and 10.11 ± 1.28 mm2 preoperatively. Postoperatively, the mean superficial and deep foveal avascular zones changed to 0.20 ± 0.13 and 0.23 ± 0.12 mm2, respectively. Postoperatively, the mean vessel density of the superficial capillary plexus changed to 1.47 ± 0.11 and 12.75 ± 1.10 mm2, and the mean vessel density of the deep capillary plexus changed to 1.56 ± 0.12 and 13.91 ± 1.35 mm2 in 1- and 3-mm zones, respectively. 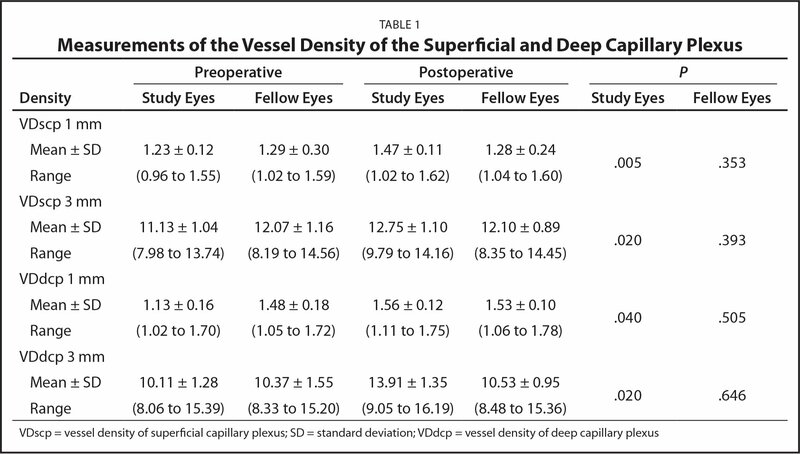 There was a statistically significant increase in vessel density measurements of the superficial and deep capillary plexus, and a statistically significant decrease in measurements of the superficial and deep foveal avascular zone postoperatively (P < .05). In the fellow eyes, there was no statistically significant change in any of the measurements (P > .05). Following strabismus surgery, vessel density of the fovea may increase and the foveal avascular zone may decrease according to optical coherence tomography angiography measurements. 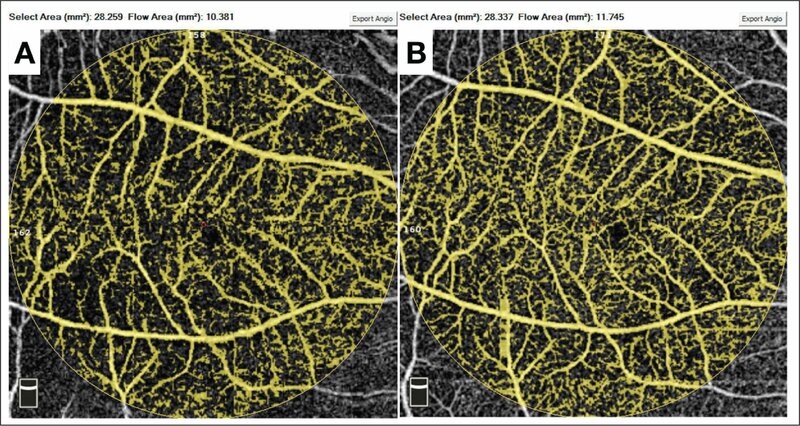 Optical coherence tomography angiography (OCTA) is a new, non-invasive imaging technique that allows visualization of retinal vasculature without the need to inject dye.10–12 OCTA can quantitatively measure the vessel density and foveal avascular zone.10,13 The purpose of this study was to use the OCTA technique to evaluate possible hemodynamic changes after horizontal rectus muscle surgery. The participants underwent standard ophthalmologic examinations, including refraction (cycloplegic refraction via sciascopy), visual acuity, slit-lamp biomicroscopy, dilated funduscopy, and axial length measurements (IOLMaster; Carl Zeiss Meditec, Dublin, CA). Inclusion criteria were age older than 18 years, a horizontal strabismus that would be corrected with surgery on two horizontal rectus muscles on one eye (a recession-resection surgery), and an axial length between 21 and 23 mm. Patients were excluded from the study for any chorioretinal, glaucomatous, and anterior segment disease; a history of previous intraocular surgery; the use of any systemic medicine 1 month prior to the study; and/or amblyopia in one or both eyes. Patients with extreme axial length and refractive errors were excluded to avoid those factors' influence on OCT measurements.14,15 Eligible patients were enrolled consecutively and their fellow eyes were used as a control group. This study was performed between May and September 2017. The study was approved by the local ethics committee and was performed according to the tenets of the Declaration of Helsinki. Informed consent was obtained from all patients. All of the patients underwent a recession-resection surgery on two horizontal rectus muscles with limbal conjunctival incision in one eye under general anesthesia. All operations were performed by the same experienced strabismus surgeon (AI). The RTVue XR Avanti (AngioVue; Optovue Inc., Fremont, CA) was used to obtain quantitative OCTA measurements preoperatively and 3 months postoperatively. 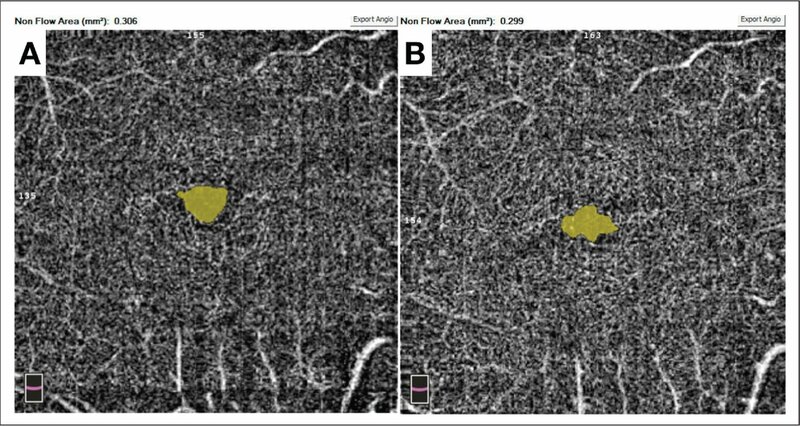 The 6 × 6 mm macular OCTA scan protocol and the SSADA algorithm were applied as defined in the literature.10,16 After the OCTA scans were obtained, the built-in software measured the flow and non-flow areas. High reproducibility and repeatability of those measurements has been shown in previous studies.17,18 All images were taken and assessed by the same retinal specialist (IY), who was masked to the preoperative versus postoperative assessment and to the study versus fellow eyes. SPSS software (version 23; SPSS, Inc., Chicago, IL) was used for the data analysis. The Shapiro-Wilk test was used to assess normal data distribution, but the data were not distributed normally (P > .05). Therefore, the comparisons were assessed using non-parametric methods. The Wilcoxon signed-rank test was used to compare the differences between preoperative and postoperative values. The authors used free software to estimate the sample size G*Power 3.1.9.2 (Franz Faul, University of Kiel, Kiel, Germany).19 With a power of 90%, a .05 statistical level of significance, and an effect size of 0.8, the sample size was calculated to be 16. The study included 32 eyes of 16 patients (9 male and 7 female) who underwent a recession-resection surgery of two horizontal rectus muscles in one eye. Sixteen fellow eyes were used for a control group. Mean patient age was 35.7 ± 12.9 years (range: 20 to 54 years). Mean spherical equivalent was −0.13 ± 0.46 diopters (D) (range: −0.75 to 0.50 D). Best corrected visual acuity was 0.1 ± 0.13 logMAR. Mean axial length was 22.15 ± 1.08 mm (range: 21.02 to 22.8 mm). Eight esotropic patients underwent recession of the medial rectus and resection of the lateral rectus muscles, and 8 exotropic patients underwent recession of the lateral rectus and resection of the medial rectus muscles. All cases showed satisfactory correction of ocular deviation after horizontal rectus muscle surgery. There were no preoperative or postoperative complications. There were no postoperative refractive changes. In the operated eyes, the authors found a statistically significant increase in measurements of the vessel density of the superficial (P = .005 and .020 in the 1- and 3-mm zones, respectively) and deep (P = .040 and .020 in the 1- and 3-mm zones, respectively) capillary plexus postoperatively (Table 1). In the fellow eyes, the superficial (P = .353 and .393 in the 1- and 3-mm zones, respectively) and deep (P = .505 and .646 in the 1- and 3-mm zones, respectively) capillary plexus measurements had no statistically significant change postoperatively (Table 1). In the operated eyes, superficial and deep foveal avascular zone measurements decreased statistically significantly postoperatively (P = .040 and P = .009, respectively). In the fellow eyes, superficial and deep foveal avascular zone measurements had no statistically significant change postoperatively (P = .370 and P = .326, respectively) (Table 2). Figures 1–2 show the preoperative and postoperative superficial and deep foveal avascular zone measurements. Figure 3 shows the preoperative and postoperative vascular density of the superficial capillary plexus in a 3-mm macular zone. Superficial foveal avascular zone measurements before and after surgery. The superficial foveal avascular zone was (A) 0.282 mm2 preoperatively and (B) 0.257 mm2 postoperatively. Deep foveal avascular zone measurements before and after surgery. The deep foveal avascular zone was (A) 0.306 mm2 preoperatively and (B) 0.299 mm2 postoperatively. The 3-mm diameter vessel density of the superficial capillary plexus before and after surgery. The superficial capillary plexus was (A) 10.381 mm2 preoperatively and (B) 11.745 mm2 postoperatively. The hemodynamic changes after strabismus surgery were previously evaluated through iris angiography and Doppler ultrasonography.1–9 Previous studies using iris angiography reported iris filling defects that were the results of anterior segment circulation disruption after strabismus surgery.6–8 Studies using Doppler ultrasonography reported contradictory results.1–5 No significant changes after surgery were reported in studies by Akyüz Ünsal et al.2 and Bayramlar et al.5 In contrast, Lee et al.1 and Pelit et al.3 reported significant hemodynamic changes. OCTA devices are used more commonly. A normative database was created for healthy children and adults in previous studies.21,22 Additionally, OCTA measurements of eyes with disorders such as amblyopia,10 diabetic retinopathy,23 central serous chorioretinopathy,16 and age-related macular degeneration24 were studied. We used OCTA to investigate the possible hemodynamic changes after strabismus surgery. There was a significant increase in the measurements of the superficial and deep capillary plexus in the 1- and 3-mm zones postoperatively (P < .05). Additionally, there was a significant decrease in the superficial and deep foveal avascular zones postoperatively (P < .05). There was no significant change between preoperative and postoperative measurements in the fellow eyes (P > .05). We believe that the changes in the operated eyes were caused by the surgery and not by other factors such as general anesthesia. Those changes may be the result of an inflammatory reaction due to surgery. The increase in blood flow can also reflect the result of a compensatory mechanism that protects the anterior segment from hypoperfusion after anterior ciliary artery injury. Limitations of this study are the small sample size and lack of long-term follow-up. Because this is the first study to present OCTA measurements from patients who underwent strabismus surgery, we could not compare our results to other studies. This study is the first to use OCTA to present the changes in the superficial and deep capillary plexus and superficial and deep foveal avascular zone measurements after strabismus surgery. Strabismus surgery seems to affect the vessel density of the macula in the short term. OCTA is a non-invasive technology that allows physicians to evaluate the macular circulation. According to OCTA, vessel density measurements may increase and foveal avascular zone measurements may decrease after strabismus surgery. Further studies are needed to confirm these data, and long-term results should be evaluated. Bayramlar H, Totan Y, Cekiç O, Yazicioglu KM, Aydin E. Evaluation of hemodynamic changes in the ophthalmic artery with color Doppler ultrasonography after strabismus surgery. J Pediatr Ophthalmol Strabismus. 2000;37:94–100. Borrelli E, Lonngi M, Balasubramanian S, et al. 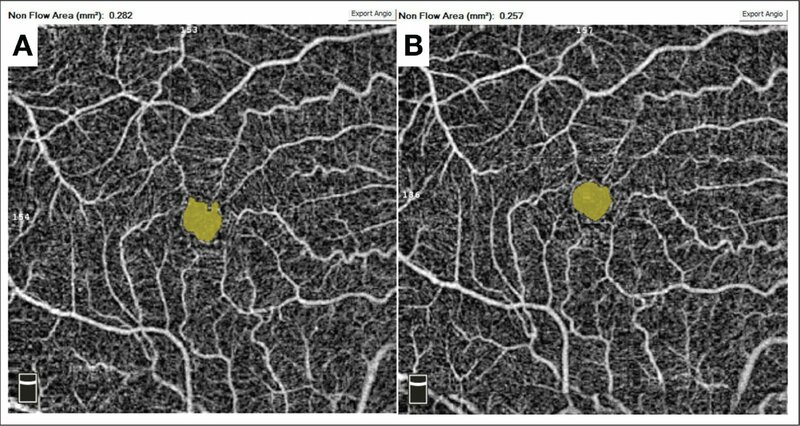 Macular microvascular networks in healthy pediatric subjects [published online ahead of print February 22, 2018]. Retina. doi:10.1097/IAE.0000000000002123 [CrossRef]. From the University of Health Sciences, Prof. Dr. N. Resat Belger Beyoglu Eye Research and Training Hospital, Istanbul, Turkey.